A guide to programming, interfacing, and using the personal computer's parallel printer port. Includes circuit designs and Visual-Basic code examples, plus tips on how to get the most out of the port, including the enhanced (EPP) and extended-capabilities (ECP) ports found on most new systems. Includes disk. It's been awhile since I've seen a book as practical as this one. Parallel Port Complete is a real keeper! 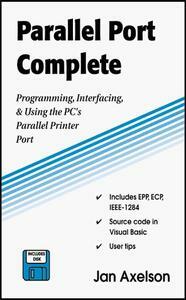 An excellent resource for Visual Basic programmers looking to interface hardware through standard ports. Anyone designing hardware to work with a parallel port is well advised to add this book to their library. 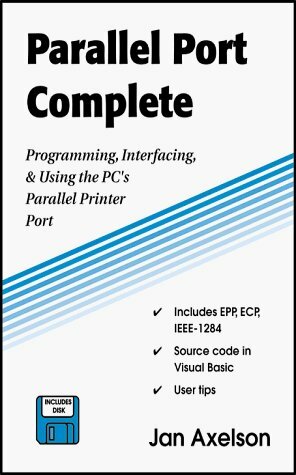 If you want to learn about PC-based parallel ports, then you need a copy of Jan Axelson's Parallel Port Complete. Good stuff. The book is written in a very readable style and starts off with the basics; you don't have to be a hardware guru to read it. If you think you might ever need to access a parallel port (under any operating system), this book is for you. If you need to do any development of parallel port devices or want to get a bit-level understanding of the port's inner workings, I strongly recommend Parallel Port Complete.